It began a few months ago, just after the 2018 football season had ended. Our Gold Coast football star, Jarrod Wallace, was looking for healthy eating options that would maintain his weight during the off season and to better prepare himself leading into preseason training for 2019. Jarrod came to visit us at Cameron’s Kitchen to check out our menu, we just liked him immediately because he’s a likeable kind of guy, easy going and was interested in what we do. He was absolutely delighted when we offered to assist him with meeting his goals. Jarrod said “A year ago, during the off season I put on a few kilos, so this year I want to be in better condition leading into the 2019 pre-season”. We did not hesitate to help Jarrod with a healthy eating plan and have been providing our nutritious fresh meals to him for a few months now. “I just love these meals” Jarrod says “I have maintained my weight and now ready for the pre-season training which I am really happy about”. We were so pleased that Jarrod loves Cameron's Kitchen meals, so we invited him to meet the Chefs who are preparing his delicious meals. 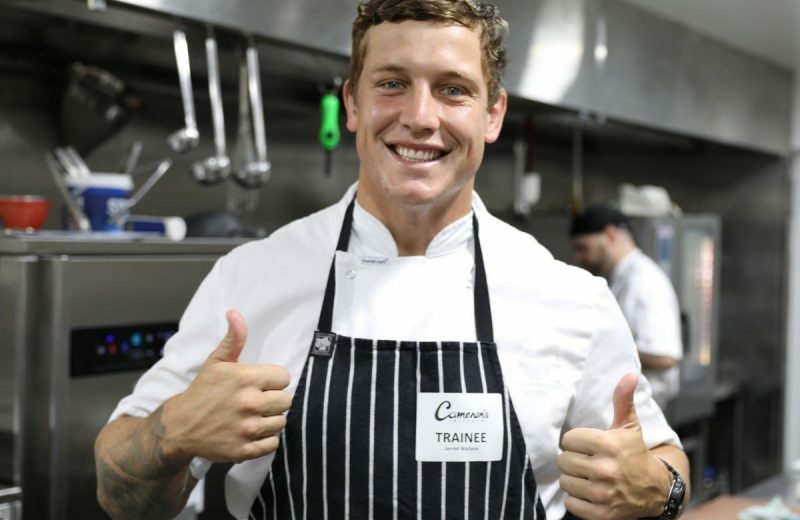 Knowing Jarrod is a fun guy, we dressed him up in a Chef uniform complete with a Trainee badge. The Chefs showed Jarrod the ropes and even had him successfully dice an onion without injury or time on the bench. Jarrod continues to love Cameron's Kitchen meals. We are happy that he is happy, and honoured to be supporting our local footy star.